Behold N159, a turbulent stellar nursery comprised of glowing gas and dark dust. 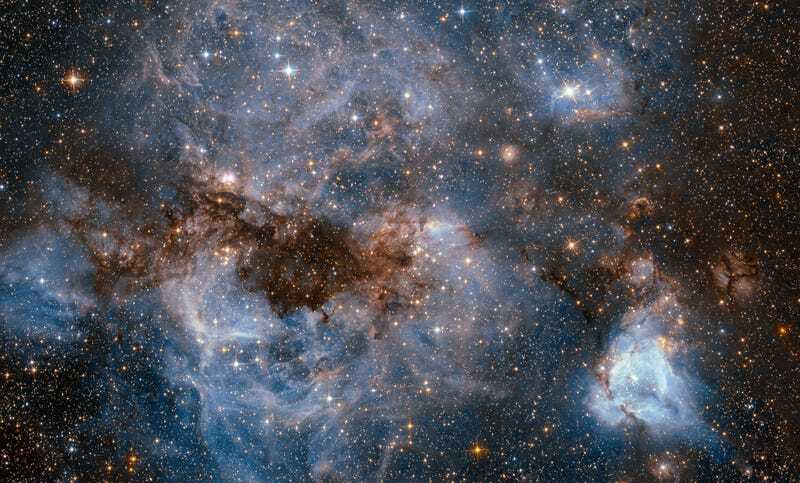 Located over 160,000 light-years away in the Large Magellanic Cloud, this type of nebula churns out some of the universe’s largest stars. N159 measures about 150 light-years across and it contains an abundance of hot young stars. At the center of this cloud is the Papillon Nebula, which as its name suggests, has a butterfly-like appearance. Astronomers refer to this particular nebula as a High-Excitating Blob (HEB), and it has been linked to the early stages of massive star formation. The Papillon Nebula’s shape may be formed by the outflow of gas coming from the strong stellar winds of newborn massive stars, some of which are 10 times the size of our sun. This image was captured by the Hubble Space Telescope, which happens to be the first telescope to ever capture this nebula in any sort of detail.